New Delhi: Housing, irrigation and roads are among the key sectors that the Planning Commission has identified as areas that could soak up large amounts of investment as the government looks to offset a liquidity crunch and jumpstart the Indian economy. “This is the time to use counter-cyclical investment in infrastructure. 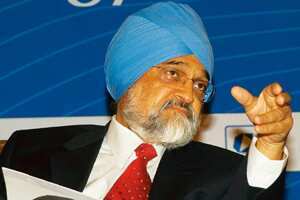 That is the major change in policy that we should be focusing on right now," said the apex plan body’s deputy chairman, Montek Singh Ahluwalia, at a conference of economic editors here on Tuesday. “I think Montek Singh and his friends would be better advised fixing day-to-day problems rather than making policy announcements because the policy has already been made. This year, for example, has been a complete washout as far as road projects are concerned, not because of financing or anything, but because of procedural issues. They should try and fix that," said Amrit Pandurangi of consultant PricewaterhouseCoopers. Dinesh Rai, secretary, ministry of micro small and medium enterprises, separately said that a committee of secretaries has been formed to recommend a financial package for small and medium enterprises (SMEs) as well. Rai, speaking at a conference organized by the Confederation of Indian Industry, or CII, in Delhi, said the Reserve Bank of India is expected to meet this week to announce major concessions for SMEs, which represent 45% of the country’s total manufacturing output and employs 42 million people.